This location allows you to enjoy the real island experience by interacting with the people and culture while being a short 15 minute ride from tourist attractions and beaches. Public transportation is a 2 minute walk away. Free airport pickup and cell phone provided! On vacation? Business? Visiting family? Or attending an event? We have just the clean, neat, safe and secure efficiency studio apartment for you. 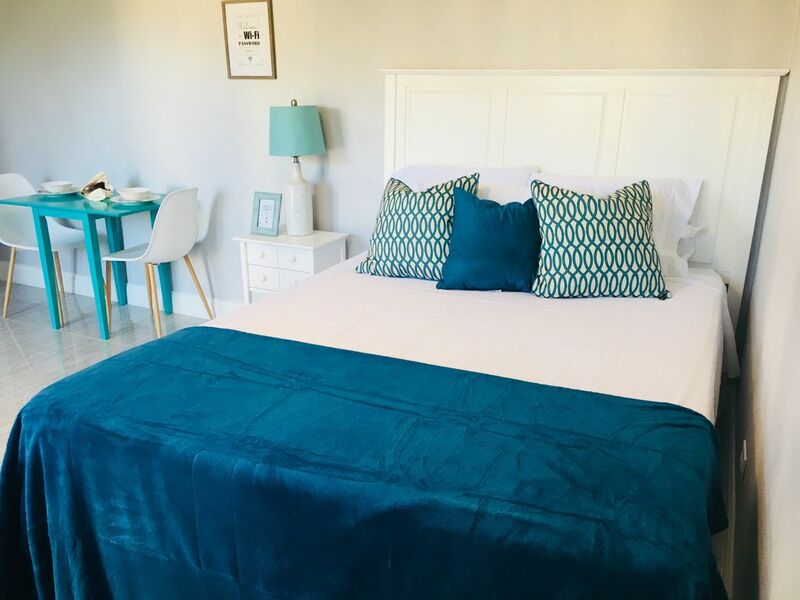 Ideal for one or two people (additional single bed available upon request when three guests), it has a living space, kitchen, and en suite bathroom with small closet and hangers. The kitchen includes a refrigerator, microwave, complimentary coffee, tea and snacks, toaster, kettle, pots/pans, cooking/serving utensils, plates, cups, glasses, cutlery, and food storage containers. A lovely spacious yard with a serene flower and vegetable garden where you can relax and enjoy the island breeze . I am just a few steps away in the unit next door to answer any queries you may have. The unit is located in the community off Carmichael road, which is considered a little city because of the numerous amenities available but still having the feel of a community. You are a few minutes walk away from local restaurants, international fast food chains, food stores and a local bank. Indoors comfy and cozy Outdoor pristine and picturesque. Unable to accommodate request for later checkout, but understandable due to prep required for arrival of next guest. The room is very clean, quiet, comfortable and beautifully decorated. Kay is a lovely hostess who takes pride in her home and goes out of her way to make her guests happy and comfortable. I will stay here again! If you want an off beaten path experience away from the resorts of the island this is the spot. Nice place to stay in a convenient location and get good recommendations for things to do and places to eat and drink. The room had necessaries so one could prepare meals there too. They were very gracious in showing us their island, picking us up & dropping us off on arrival & departure and taking us to Fish Fry or to pick up sites for activities scheduled. I would definitely book this property again for our next stay in Nassau. The property has all the basic essentials for the stay. The owners are very helpful and accommodating. We got to experience the Bahamian culture in all its forms; food, people and welcoming atmosphere. Thank you Linda and Kay. Next to the personal note and the outstanding cleanliness, the accommodation was just a perfect match for us. Kay was a Great Host and we highly appreciated her pick up service from the airport. I'd highly recommend her Appartement.